Why I Think the Flips Bracelet is Brilliant – Love. Life. Practice. If you’re reading this, it’s probably because you know that I’m interested in personal development. How do we develop habits? How do we change them? I’m a freelancer, an entrepreneur, and a fanatical autodidact. Trying to fit everything I want into a day is impossible; there are always So Many Projects as well as So Many Things to Learn. It’s easy for the rituals of self care to be overlooked: meditation, journaling, yoga (ugh! Yoga!). Also, I’m an early adopter and frequent user of technology, and like many who struggle through the bugs and bloat of the latest apps & devices I have a love affair with “lotek” – things that don’t require obvious technology, such as notebooks and pens and yoga mats (ugh!) and nice desk chairs and such. I get two or three emails a week from people who are pitching their own personal improvement apps or products to me, asking that I share it here on the blog. This may surprise you, because I don’t do it very much. So when I tell you that I am enthusiastically recommending the Flips Bracelet, you can understand: I’m really excited about this. Also, full disclosure: while I was granted access to the press kit, I am not in any way being compensated for what I say and share here on this post. Its brilliance lies in its simplicity. 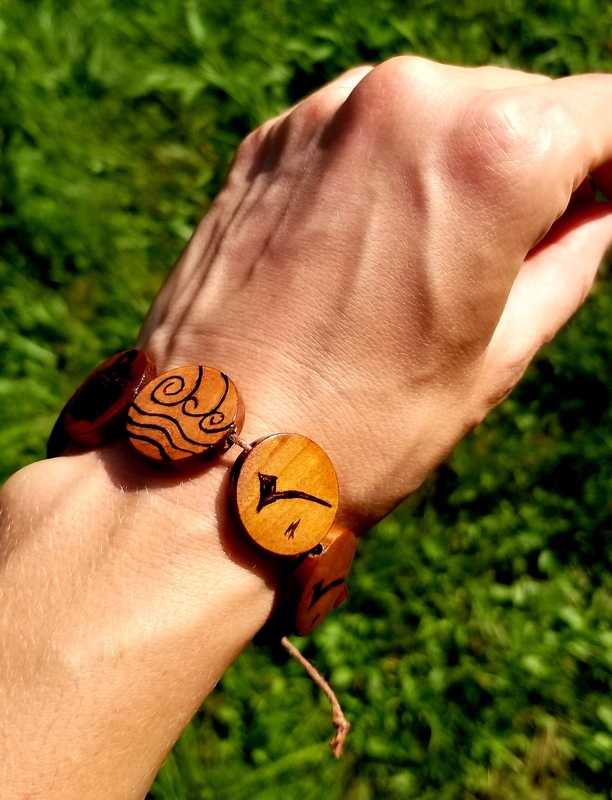 It’s a string of flat wooden beads around your wrist. Each bead has a tiny symbol burned on it that represents something you want to remember to do during your day – a pen for writing, a barbell for exercise, a heart for telling someone you care for that you love them. At the start of your day, all the beads are facing out. Note: first bit of joy for me is the way this incorporates visual thinking and iconographic power into the everyday. Our brains respond to symbols more readily than text; plus, the icons are burned into the beads by a Pyrographer, and that’s just gotta be one of the coolest job titles ever. During the day, the bead is a constant reminder that there are things you want to do, daily, and because you can see the icon, you haven’t done them yet. So eventually you say Fine, already, I’ll do my (ugh) yoga! And after the asanas are done, you flip the bead. On the other side, burned into the wood, is a viscerally satisfying checkmark. 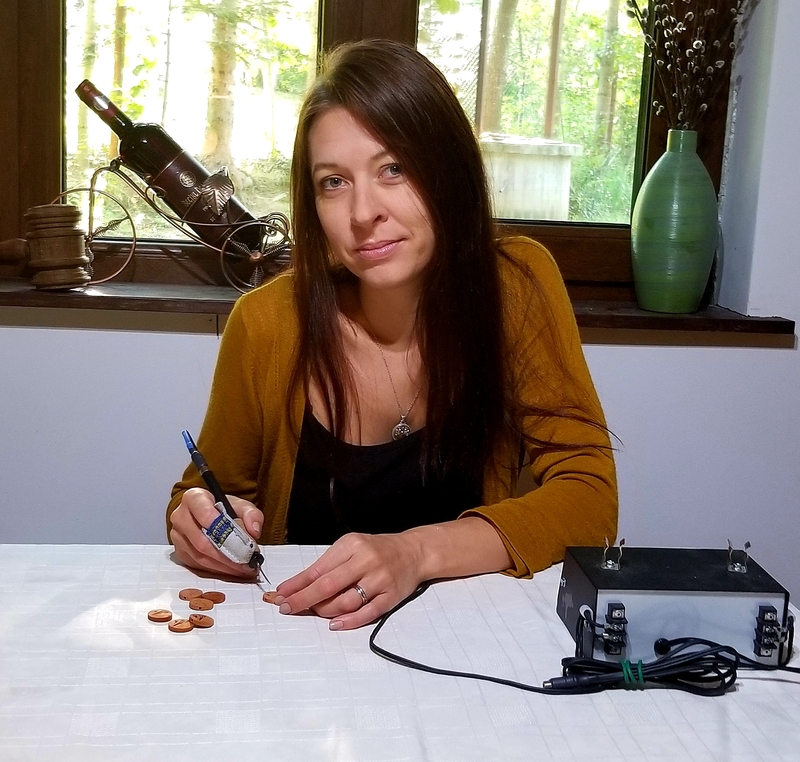 Kim is the aforementioned “pyrographer”, and she hand-makes the beads (for now – she’s resistant to the idea of manufacturing, but if demand got too big she has said she likes the idea of outsourcing to other artists to help them make an income from their craft). I couldn’t agree more. My partner Natasha does already, a pretty little device called the Leaf, and I do too, a slightly less pretty device called the Apple Watch (series 1, for you tech nerds who were wondering). And we both love our little devices. But this will never need charging, will never need to sync, will never be like my favorite meditation app, Mind, which no longer works anywhere. Launching on Kickstarter TOMORROW, October 9. Whatever. The point is, it will be personal to me. And that, I think, is a brilliant. I couldn’t agree more. What a great concept – for all ages. Women, men, young, and old. Count me in!